Sound is one of the most important aspects of home videos. It is difficult to hold a viewer’s attention without a soundtrack, regardless of whether that is ‘live sound’ recorded at the same time as the video, or ‘overdubbed’ sound – for example incidental music. Just as difficult, however, is the actual process of recording. With or without expensive, professional equipment, there are a number of techniques that you should master in order to ensure you get the best possible sound on your recordings. You cannot hope to produce good quality sound recordings unless you have a basic understanding of the equipment you are using. The microphone is the most important part of this equipment. There is a wide variety of microphone types. Cheaper video cameras will, unsurprisingly, have less efficient microphones attached. Frequently these are built into the camera body, protected by only a grille. These microphones tend to react very badly to background noise; they will pick up every frequency and, as a result, the subjects may be drowned out. Many cameras, however, allow the user to attach a separate microphone to the body. This is very useful, as you can choose a more efficient microphone than those that come as standard. 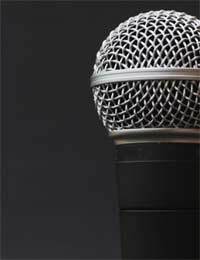 Furthermore, you can choose a microphone to suit your specific requirements and environment. To begin with, you should understand the difference between omnidirectional and unidirectional microphones. Omnidirectional mics pick up sound from every angle around them, while unidirectional versions only sense sound when it comes from one specific direction. Many camera microphones are unidirectional; they are frequently shaped like a pencil, and are sometimes known as bullet mics. Unidirectional microphones are very useful if you want to isolate sound. For example, if you want to pick up speech from the individual on whom the camera is focused, a unidirectional mic will allow you to do this while filtering out extraneous noises. In contrast, an omnidirectional mic will provide a more accurate sense of the ambient sound, but will be less effective at isolating individual frequencies. While the most important aspect of recording is capturing a good sound in the first place, the actions you take later can have a significant effect on the quality of your soundtrack. Most video editing software includes audio editing capabilities; the complexity of these will vary depending on the nature of the program. While the most basic software may only include volume editing functions, manufacturers are increasingly offering the ability to alter the actual sound of your recording. Much of this is achieved through the use of EQ, or equalisers. This technique allows you to boost or reduce the volume of individual frequencies in your recording; this is particularly useful if you want to reduce background hiss, or increase the volume of your subject in relation to the background noise. EQ takes some practice, but can yield excellent results with a little work. Finally, it is important to remember that great soundtracks can be achieved with relatively inexpensive equipment. The march of consumer technology continues apace, and tolls that can produce almost professional results are now available for very little money. As such, make sure you experiment with your existing equipment before shelling out for upgrades.